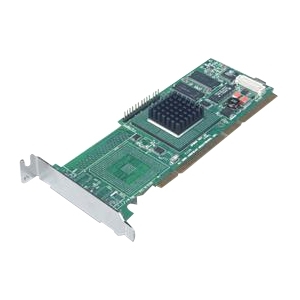 The new Smart Array 642 Controller (SA-642) is a 64-bit, 133 MHz PCI-X dual SCSI channel PCI array controller for entry level hardware-based fault tolerance. Utilizing both SCSI channels (1 internal and 1 external) of the SA-642 allows you to configure up to 20 hard drives (6 internal, 14 external) to store up to 2.9TB of storage per PCI slot. The SA-642 provides high reliability and increased performance over the Smart Array 532, thus providing excellent value and lowering the total server ownership cost. In addition, the SA-642 is data compatible with all Ultra 320, Wide Ultra3 and Wide Ultra2 drives, offering an unparalleled degree of investment protection. Designed and integrated with HP entry-level and workgroup ProLiant servers, this product provides worry-free data protection.